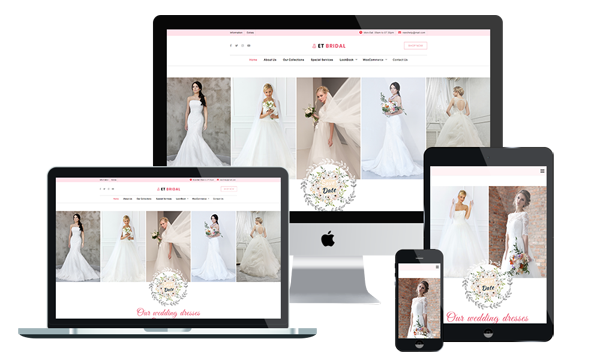 ET Bridal is Responsive Joomla! template that targets for bridal shops or wedding shop websites. Wedding Joomla! template offers lots of features that facilitate great visuals to help market the latest products in your bridal shops. It also builds with latest Bootstrap CSS Framework, Support Font Awesome and K2 extended style. Furthermore, it comes with 4 color schemes helping to create excellent websites with various layouts. The fully responsive design of these templates guarantees that clients will be able to view your website properly at any time. They can choose any platform including mobile to browse through your latest bridal products. With cross-browser compatibility, users can visit your website through their favorite browser. Finally, you can leave any contact details and important information about your bridal shops in the HikaShop page. Customers can also reach out to you with the user-friendly contact forms. Use Wedding Joomla! template to make selling wedding items much easier!